Hotels in Venice tend to stick to the traditional in their décor. Even the modern redecorated hotels aim for a kind of Venetian-lite look, assuming (probably correctly) that their international guests have come to Venice for the whole experience: curly Murano glass chandeliers, wavy bedheads all gilded and painted, framed Canaletto prints... There are a just few that have dared to be different – some going for a sleek modern look and one or two achieving an ambitious blend of contemporary and ancient. Personally, after an overpowering trip to La Fenice (like drowning in a chocolate box) I understood where the pastel-and-gold hotel decorators were coming from... but I'd have welcomed a change.There's plenty of Venetian style around Venice – why not embrace some great contemporary design when you return to your hotel? Venice, were it not for the restrictions designed to protect its history, might be a much more obviously design-oriented city. A few striking modern buildings are hidden around the lagoon in unobtrusive locations, though a Frank Lloyd Wright building on the Grand Canal never won planning permission. There is a leading architectural faculty in Venice, and the local architect Carlo Scarpa carried out a number of prestigious interior design projects in the town centre. Venice is also the home of a big architecture exhibition, the Architecture Biennale (held in even-numbered years), and attracts thousands of artists and art-lovers for the showcase Art Biennale (odd-numbered years). So stylish contemporary design ought to be as authentically Venetian as the pastiche papier-mache which tourists see everywhere. 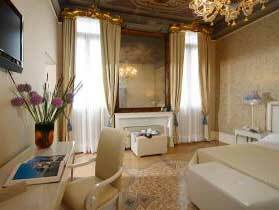 In a great location for first-time tourists, between St. Mark's and the Rialto Bridge, this successful 70-room four-star may class as too big to be a boutique hotel but it does lay claim to 'design hotel' status. It has certainly made an extra effort with its styling and design. 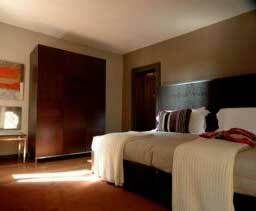 The hotel is an efficient modern hotel for a comfortable stay and even has a wellness centre. I've stayed there, enjoyed it and written a review. Smaller and with fewer amenities than a conventional hotel, this little accommodation option close to the Rialto is one of the boldest style hotels you'll find in conventional Venice. Avoid the cheapest 'touristic' room category, and opt for one of the swanky design rooms where modern decor sits amid historic splendour. In an evocative little corner of the centre. Note that although it is unusual and interesting, the customer ratings (like the prices) are less high than other, more luxurious options on this page. Read the reviews and find out more. A landmark hip hotel in Venice, Charming House DD724 is in the fashionable Dorsoduro district (DD724 refers to the address), between the Guggenheim and Accademia art galleries. A thoroughly fitting destination for art and design-conscious travellers, the boutique establishment has 12 bedrooms and common areas including a library. Expensive, but look out for special offers. 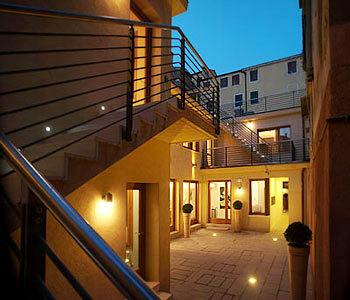 The elegant Liassidi Palace is in a quiet lane not far from St. Mark's and the Riva degli Schiavoni waterfront. Outside, it is a beautiful pale pink palace, inside it is stylish and modern. 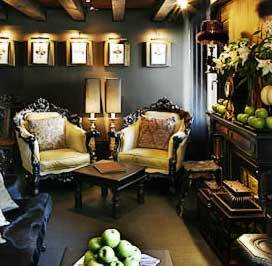 It's a thoroughly charming place to stay; the type of hotel that holidaymakers aspire to discover. Ca' Pisani led the way for design hotels in Venice. It is decorated in a 1930s/40s retro style and is an attractive as well as comfortable place to stay. It boasts a traditional Venetian altana, a wooden sun-terrace on the roof. The location is close to the Accademia Bridge, so is practical for sightseeing on both sides of the Grand Canal. 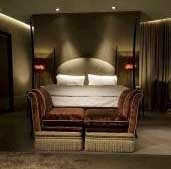 Not really a design hotel, but still one with very modern, elegant and comfortable interiors. With just fifteen rooms, the Due Principi can describe itself as a boutique hotel, and it has a refreshingly light and contemporary ambience. 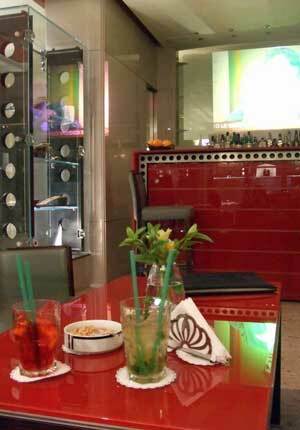 Most of these trendy hotels are in the San Marco (touristy) and Dorsoduro (arty) districts of Venice. 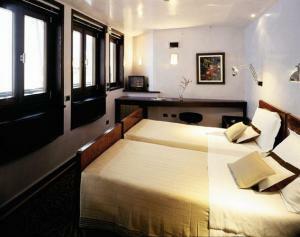 Ca' Pozzo Inn stands out for its Cannaregio location, in the famous Jewish Ghetto not far from the railway station. 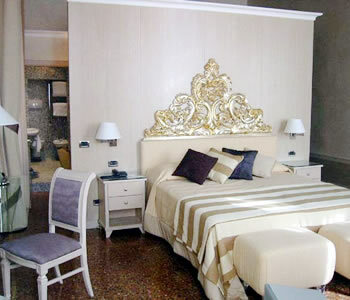 This affordable small hotel is a real novelty in Venice as the exterior design is also modern. The style leans towards the minimalist, with Japanese influences, but doesn't compromise on guests' comfort. 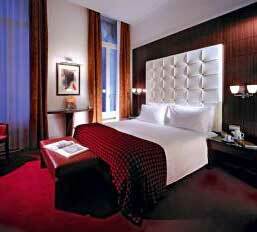 Situated not far from the Rialto, Palazzo Barbarigo is a small hotel with ambitious art deco-inspired designs. It is actually on the Grand Canal, and has its own landing stage - ideal if you wish to arrive in style by water taxi. Selected below are some additional modern-style hotels and B&Bs we considered for this list. While they may not boast cutting-edge design, they are comfortable and stylish and a little more contemporary than typical Venice hotels.